Stayed here 2nights. I booked double bed room but they didn’t prepared for one night. I went there with my boyfriend and they’d like to give us twin bed room. So I strongly said I don’t want it and they change our room eventually. If you have some special request, you should double check about it. The room condition is not bad but I didn’t like the light and the bed at standard double room. The light was too dark and the bed was squeak. Staffs are kind and they did their best to provide a good service about I asked. Of course they speak good English. This is quite expensive for the standard of room which OK but nothing impressive. We had 2 rooms overlooking the river which was amazing. Without that I don't think I'd have paid that much. The breakfast was very good and it's easy to go out and find somewhere to eat in the evening. The swimming pool was quite cold but that seems normal in Thailand and Laos. On a later trip my wife and I used another cheaper hotel as we had my stepdaughter with us so I had to pay for 2 rooms myself. I'm glad experienced the room overlooking the river though. This is a lovely place to stay for a couple of days. Peaceful garden, very nice swimming pool, excellent quality for price , and delicious food. Yes, we will come back and stay more than 2 days this time... 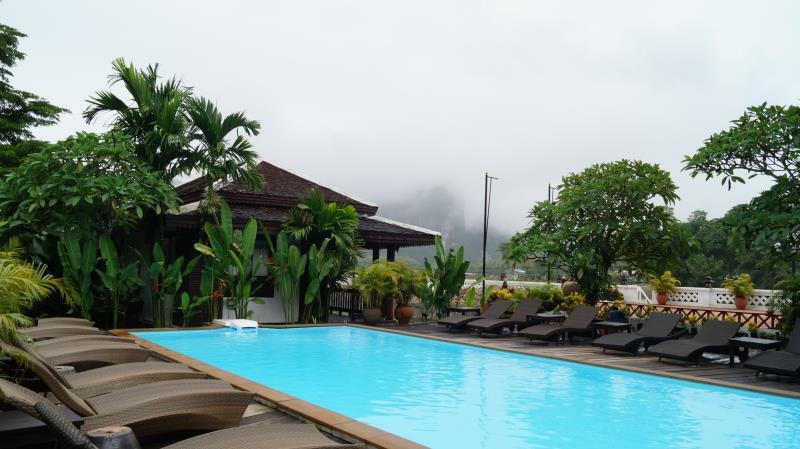 Excellent organization to visit Vang vieng from this hotel. Thanks so much for these magic days. i was traveling with friends on a photography trip to vang vieng. we did not expect too much as the price was very cheap. but after we checked in, we were amazed at the facilities for the price that we paid. the breakfast is held in an excellent location next to the river with a good view of the bridge. 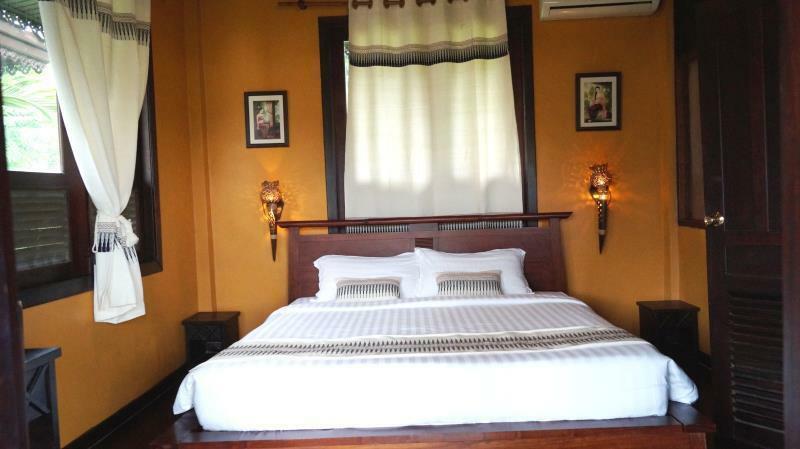 the hotel is situated in the center of town with lots of restaurants and massage parlors. massage is cheap at kip (little less than us$ 7) for oil massage (i usually pay us$ 30 in thailand where i am staying). excellent massage just a few minutes walk from the hotel. highly recommended. Very well located hotel in the middle of Vang Vieng, Laos. We were traveling from Luang Prabang by van to Vang Vieng and arrived late at midnight. There was a receptionist waiting for us and quicly showed us to our rooms. We got the rooms next to the river. The rooms are beautiful with a large size bathroom attached. For the price that we paid, it was well worth it. The breakfast was a bit limited but the view was excellent from the restaurant. Highly recommended. stayed one night and wish we could have stayed longer. resort right on river with sounds of gurgling water to help relax and soothe you in the evening. food was excellent and staff was friendly and helpful. do take the boat trip up river beautiful scenery and very relaxing. The resort is in a quiet area but we were able to walk into the main town within 10 mins. the restaurant offers good food and overlooks the river. the pool is clean and refreshing. The staff are very helpful and happy - the room was clean and very comfortable but a bit small - it didnt bother us though. The bathroom was huge with top ups of all the lotions and potions every day. the bungalow has a patio where you can sit and unwind. The wifi was a tad slow but we got through ok in the end. There was some building work going on which is necessary to keep a resort fresh and modern - building work seems to be happening all over Laos. The town was not full of drunk teenagers due to new laws concerning the high death rate of drownings when tubing. We enjoyed our tubing experience alone of the river for 2 hours drifting with the current amongst the fantastic scenery. 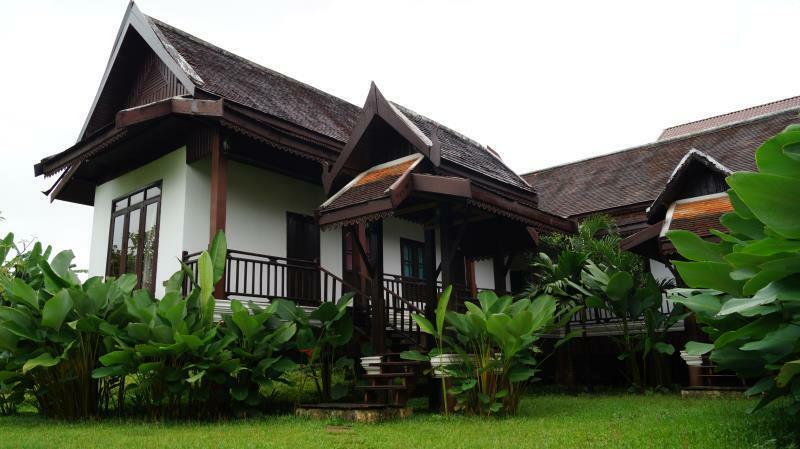 We stayed at Villa Vang Vieng Riverside for 5 days and loved it. Great views, quiet, nicely styled.